An 11-year-old boy has a fatal form of leukemia and doesn't have much longer to live. Caleb Hammond and his family had to make a difficult decision. Continue painful treatments that were failing to cure him, or have Caleb come home to live the rest of his life with his family Oskaloosa, Iowa. 42-year-old Chris Playle of Oskaloosa said, "There were some other options left, but they were going to make him sick and do harm to his body. They decided to call it quits and come home and be a kid and do the things he hasn’t been able to do the last year-and-a-half." Caleb has been a huge fan of racing since he was a small child and is now asking people to send him stickers he can place them on his casket for when he dies. So far there has been a huge response to Caleb's request. "We’re trying to get a bunch of them. We’re trying to decorate his casket," Caleb's father said. "We’re just trying to do as much as we can with him while he’s here." A 2-year-old Caleb would visit his uncle's house across from the Southern Iowa Speedway in Oskaloosa instilling a love for the track in the boy forever. As the drivers used to show up before the pits would open, they would park their cars on the streets allowing Caleb a full view of them. "He’s my racing buddy. It was kind of our deal," Playle said. "I probably had just as much fun as he did." 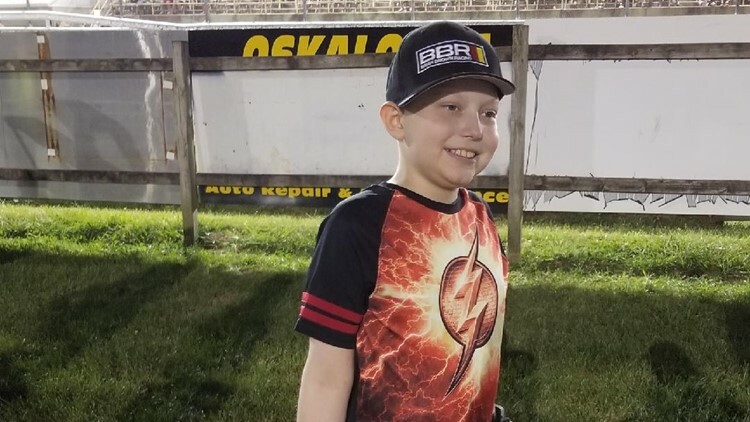 The racing fan began experiencing what his parents thought were growing pains but he was soon diagnosed with B-cell acute lymphoblastic leukemia. The disease then spread to his shoulder and neck. It also caused constant pain in his leg as doctors misdiagnosed it has mononucleosis or walking pneumonia. It wasn't until age nine that Caleb would be diagnosed with the acute form of leukemia. Caleb traveled to Tennessee for a bone marrow transplant in January but to no avail. Acute leukemia would continue to return aggressively. He has now been home for about three weeks. "Medically, he’s still pretty strong," Playle said. "I know later on in the evenings he’s tired, he’s ready to settle down … He gets worn-out kind of easy. But otherwise, he’s still pretty strong and spirits still pretty high."